The Inbound Growth Blog covers all topics relating to an integrated marketing strategy. We write about inbound marketing, social media, integrated marketing strategies and the sales process. If you're not using technology to execute your professional services marketing strategy, you're living in the dark ages. With free and low-cost options available, there's really no excuse not to be using growth stack technology in your business development process. When used properly and contextually, growth stack technology can actually make your sales and marketing outreach more human. What is growth stack technology? At its core, growth stack technology manages interactions with people - from marketing to sales to service delivery. At the heart of any growth stack technology is a robust contact management database. The top of the funnel is lead generation - beginning relationships with potential buyers by educating them on problems you solve. The middle of the funnel is lead qualification - focusing limited sales and marketing resources on high-probability buyers. The bottom of the funnel are sales opportunities - working with qualified buyers who are moving towards a decision in a buying process. Growth stack technology tracks prospect and customer information from lead generation through the sales process to service delivery. A CRM (customer relationship management) system tracks contact interactions with your company and reminds you to complete the tasks necessary to help move prospects down your sales funnel. It also tracks sales opportunities and gives the leadership insight into the sales pipeline. Marketing automation software facilitates lead generation on your website, thought leadership publication and promotion, and executes and tracks marketing campaigns. Sales software helps business development professionals prospect target opportunities, tracks prospect activity and makes it easy for potential customers to buy from you. Here is a graphical depiction of the core growth stack elements. The first approach is a "best in class" approach where the business chooses the best option for each element of the core growth stack platform. For example, one might choose the Salesforce CRM, Marketo marketing automation software and Cirrus Insight for sales and email tracking. This is in fact what many enterprise companies do to execute their sales and marketing. The challenge lies in integrating all of the various elements so that the core works as a cohesive whole. The advantage of this approach is that each core element is integrated out-of-the-box that requires minimal set-up and integration hassles. 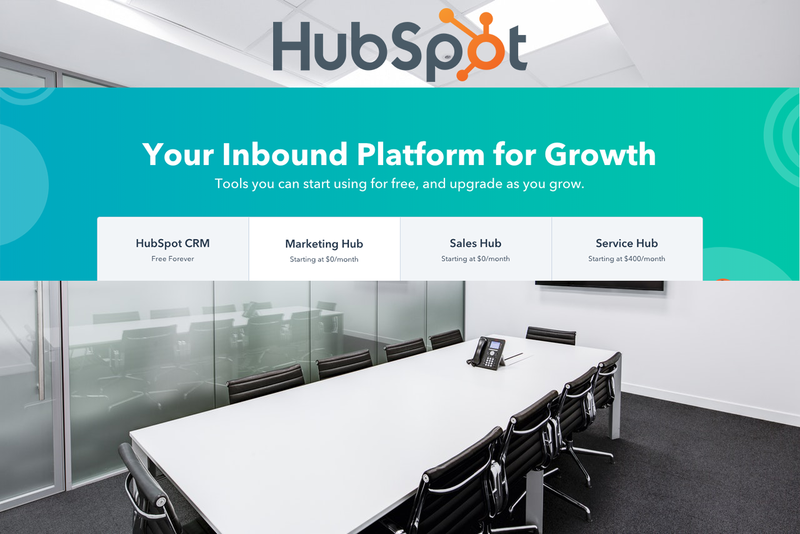 We recommend the HubSpot Growth Stack for professional services firms. We're a HubSpot Certified Agency Partner and may be a bit biased, but we use it for own sales and marketing efforts. Consider the nature of most professional services businesses. Most professional services have fairly high deal values with a small number of deals required to hit growth targets. A $5 million dollar new business goal might consist of 50 new customers with an average annual deal value of $100,000. For a software company to hit the same $5 million dollar goal, it may need to sell 5,000 software subscription with an average deal value of $1,000 annually. Clearly, there's a vastly different dynamic in selling 50 large deals compared to selling 5,000 small deals. Targeting and qualification is much more important - you just can't afford to waste time on prospects that aren't likely to pay you $100,000 for your services. It's much more important to strategically manage each opportunity in the professional services field. I frequently see professional services businesses using Salesforce for their CRM. I'm not knocking Salesforce - it's the best CRM available. But these businesses use 5% of the capabilities of Salesforce and struggle to integrate it into their business development process. It's often overkill. We like the HubSpot Growth Stack because it's easy to use out of the box - much like Apple products. My MacBook Air and iPhone work very well together with minimal effort on my part. To give you a sense of the volume HubSpot manages for us, we're getting about 7,000 website visitors per month and generating roughly 100 inbound leads per month. There are many different versions of the various elements of the HubSpot Growth Stack. In the interest of brevity, we're going to stick to some of the features we think are particularly useful to professional services businesses. You can see a complete breakdown of the feature set for each option here. HubSpot's business model is based on giving organizations access to affordable and effective technology that will produce enough wins to justify moving up to the next level of functionality. The key feature of the HubSpot Growth Stack is a robust, feature-rich contact database to manage your relationships with customers and prospects. Include in the contact database is access to HubSpot's lead intelligence tool for companies and contacts. For companies, the lead intelligence tool gives you demographic information like revenues, number of employees and website. For contacts, the tool shares information like Twitter handles and job titles. HubSpot started it all with their inbound marketing software, so that's where we'll start. For those just starting out, HubSpot has a Free Marketing tool. The main thing that it does is allow you to embed lead generation forms on your website and collect contact information from interested visitors - the core function of inbound lead generation. For WordPress users, there is a HubSpot plug-in and code snippets are available to embed forms on other websites. Another nice feature is contact activity tracking - letting you know which web pages your leads visit and which content they download. For the free version, activity tracking is limited to the first 7 days after the contact completes a form on your website. Paid versions include unlimited activity tracking. If you're using Facebook marketing, the free tool has a feature that lets you create and manage Facebook Lead Ads. The free version comes with HubSpot branding; the $50 per month Starter Marketing Tool removes the HubSpot branding and provides full phone and e-mail support. For those with limited budgets, this is a great way to start managing and executing parts of your business development process with technology. What I like about the basic marketing tool is that all of the components are integrated. You don't have to patch together separate social media, email marketing, SEO, and blogging tools - they are all included and integrated. The analytics dashboards allow you to use a Lean business development process, using marketplace feedback to measure and optimize tactics. The Basic Marketing Tool is a value starting at $200 per month. Add-ons include the HubSpot website platform, an upgraded Reporting capability and a Digital Advertising tool. The HubSpot Basic Marketing tool is limited to businesses with website visits of less than 3,000 per month. Basic Marketing is a great place to start for businesses who want to implement growth stack technology and get some experience (and success!) under their belts before moving up to the next level. HubSpot's Professional Marketing Tool, starting at $800 per month, is a highly capable marketing automation tool that allows you to automate many of your processes like lead segmentation, lead qualification, lead scoring, and contextual marketing. 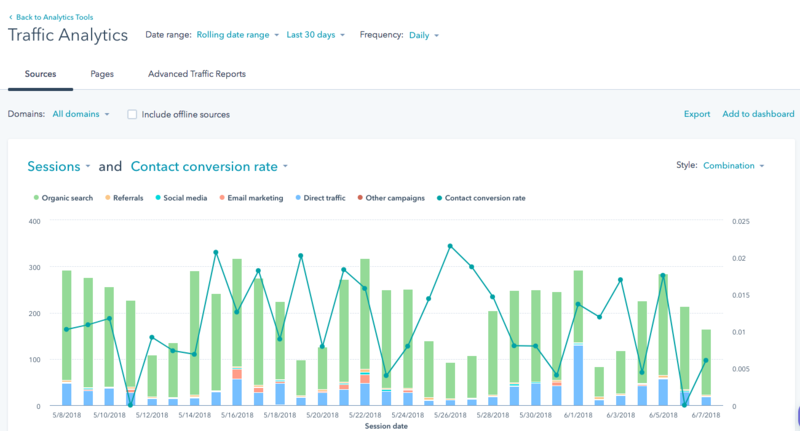 "HubSpot’s new Content Optimization System helps you deliver “Smart Content”, or content that is intelligently personalized to your customer’s needs. With Smart Content, you can deliver content specifically tailored to where a prospect is in the buying process, or content targeted to people the very first time they visit. Smart Content lets you target content based on anything you know about your contacts, for true relationship-driven marketing. Smart Content alters the content displayed within rich-text, HTML, or form modules depending on viewer characteristics. Much like HubSpot’s Smart Calls-to-Action (CTAs), Smart Content can be tailored to anonymous visitors based on their location, device, or referral source. Or, you can tailor content to known visitors based on Smart lists, or the contacts lifecycle stage. By creating Smart Lists that recognize your different lifecycle stages, you can customize the content that people in each lifecycle stage will see. Visitors see content personalized for them." HubSpot Professional Marketing is an excellent option for businesses that want to use the power of technology to automate processes and use context to provide a great user experience for their business contacts. Unless you're managing $100 million+ in revenues, Enterprise is likely more than you will need. The HubSpot CRM is HubSpot's sales tool for companies (Sales is the tool for individuals.) The HubSpot CRM is free and always will be. HubSpot's designed its CRM with the sales person in mind - automating most of the data input. The CRM shares the same contact database as the marketing platform and information flows effectively into the contact record from both systems. When a meeting or a phone call is scheduled, a quick review of the contact record provides insight into information like which web pages she has viewed and which emails she's opened. This allows for contextually-based conversations which focus on what's important to her. Customer deal management - you can build deal flows based on mileposts in your sales process. By assigning deal values and win-percentages at each milepost, business leaders can monitor the sales pipeline and make tactical adjustments as necessary. Gmail and Outlook integration - the CRM includes out-of-the-box integrations with Gmail and Outlook. You can use most of the features of the Sales tool directly from your Gmail or Outlook inbox. Tasks - follow-up emails and calls can be set up and tracked through the CRM. Business development team members can add notes to document calls and conversations. Contact management - the CRM uses the same contact database and engine described in the review of the Marketing software. If you're not using HubSpot marketing, you still have access to the contact database. When used in conjunction with the Sales tool for business development professionals, the HubSpot CRM is an excellent option to manage your business development function. HubSpot's Sales Tool for business development professionals is the companion piece to the HubSpot CRM for companies. The combination provides an efficient tool to manage business relationships and provide leadership insight into progress against growth targets. Contact management - shares the same contact database and management engine as CRM and Marketing. CRM Access - business development professionals can update/edit tasks and deals to reflect most recent status. Email scheduling - schedule future sends directly from your Outlook and Gmail inbox. Email tracking - monitor opens of your emails and clicks on the links you include. Email templates - create templates for contextual situations like a trigger event or contact download. Use your insight into the recipient's situation to create unique emails based on the templates. Documents - upload frequently used documents like case studies and eBooks to share directly from your Gmail or Outlook inbox. The tool tracks when and if the recipient accesses your document. Meetings - the meetings tool uses the Outlook and Gmail integration to enable prospects to schedule calls and meetings directly in your calendar. Links can be shared in emails, email signatures and website. Calling - the CRM includes a soft telephone that lets you call contacts from your desktop and record the calls into the CRM. The free version includes up to 15 minutes of call time per month. Prospects - this feature shows you domain information for anonymous website visitors. While it doesn't track individuals, it shows you which companies are visiting your website. If you use Gmail or Outlook, Sales Free is a great way to be more efficient in business development activities. Email sequences - sequences lets you create a series of email templates based on action your contact takes and sends them out on a pre-determined schedule. Live chat - you can embed a customized chat tool on your website using Live Chat. HubSpot recently added a bot feature that lets you collect information and respond appropriately using Artificial Intelligence. Phone and email support - not available in the free version, Sales Starter gives 24/7 access to HubSpot's support team. As a small business owner, we need to be efficient in our business development process - we just don't have the time or resources to waste time on leads that don't fit our target profile. Through our content marketing efforts, we generate 6,500 - 7,000 website visitors and 80-100 inbound leads. We're defining an inbound lead as someone who's found our website and completed a form to download a content offer or schedule a business development consultation. Through experience, we've learned that 25-40% of our leads in any given month are "marketing-qualified." A marketing qualified lead is one that is located in the United States, is in one of our target industries and has a role in their company that plays a role in the buying process. Here is how we use the HubSpot Growth Stack to automate the process. We use the blogging and website tools in HubSpot Marketing Professional to attract potential buyers to our website. We generate approximately 6,000 unique organic website visitors per month through our content marketing efforts. We use the landing page, forms and CTA tools to convert website visitor to leads by offering premium content in exchange for contact and demographic information. We generate between 80 and 100 inbound leads per month. We use the marketing automation tool to send the requested content to our leads. If someone requests a business development consultation, we use the meetings tool in Sales Starter to let them schedule the consultation immediately. If you look at the content offer at the bottom of this post, you will note that there is a form that asks for contact and demographic information. There are 3 demographic questions that use a dropdown menu to make it easy to respond. We ask questions relating to industry, role and if someone is a HubSpot customer. We use the marketing automation tool in HubSpot Marketing Professional to identify leads that meet our target criteria based on answers to the 3 questions and if the IP address is in the US. If someone meets our marketing qualification definition, we use the marketing automation tool to notify the appropriate business development professional that there is a new marketing qualified lead for them to address. The BD professional representative applies the human touch, researching the company website, LinkedIn and the lead intelligence tool in the HubSpot CRM to further qualify the lead. If the BD professional feels that the lead is worth pursuing, she marks it as a sales-qualified lead in the CRM. The BD professional uses the sequences and template tools in HubSpot Sales Starter to create customized email sequences to follow up with the lead. These are not one-size fits all nurturing emails. The BD professional uses context they learned in researching the lead to create emails that address the lead's unique situation and needs. Through the emails and follow-up phone calls, the lead either becomes a sales opportunity or is cycled for long-term lead nurturing. By automating our process with the HubSpot Growth Stack, we're able to focus on the 25-40% of our leads that are marketing qualified and use sales outreach customized for their unique circumstances. The fully-integrated HubSpot Growth Stack is the perfect tool to manage your professional services business development process. For a demonstration and evaluation of how you can use HubSpot at your company, schedule a time to talk with me. John Beveridge John Beveridge is the President and Founder of Rapidan Inbound, an Inbound Marketing Agency and HubSpot Silver Certified Agency Partner located in Tysons, VA. Prior to founding Rapidan Inbound, John spent 25 years as a management consultant and specializes in helping professional services and technology firms grow rapidly with inbound marketing and sales enablement strategies. John is a Social Media Today contributor and currently serves as the Chair for the Northern Virginia Technology Council's Business Development, Marketing and Sales Committee.